People Like You are known to be a label specialised in psychobilly, but sometimes they also dabble in different genres. The fact that they decided to release an album by country artist Bob Wayne is not so surprising once you remember that they did the same already with the not so different Chip Hanna. Bob Wayne considers his music as a link between outlaw country and contemporary punk rock. 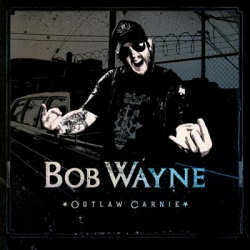 Outlaw Carnie is his fourth CD, but only the first one to be released on a bigger label. He is backed by musicians who gathered already experience with the likes of Johnny Cash, Bob Dylan and Hank Williams III. Double bass, violin and banjo do their best to create a authentic country atmosphere. I am definitely not an expert when it comes to country music, but it seems to me that Johnny Cash must have been a major influence to Bob Wayne. Both artists don’t sound too extreme, and the vocals are clear enough to be understood. Another similarity between them is their fondness for topics like crime, gambling, cheating, brawling and of course alcohol. Even though most of the songs sound rather traditional and moderate, Bob Wayne is not afraid to speed up the pace occasionally. Whenever that happens, parallels to Mojo Nixon and Mike Ness are in order. Another advantage of this album is the Bob Wayne’s charismatic voice. Even if you don’t consider yourself a big country fan, you might get some pleasure out of Outlaw Carnie. Bob Wayne has managed to create a very balanced album that presents different faces of country music. Purists might not be shied away, and rock fans will not dismiss him as some redneck hobo. Although this music works probably much better on muggy Summer evening than during cold Winter nights.